Here is the mistake finding picture puzzle to test your visual and observational skills. 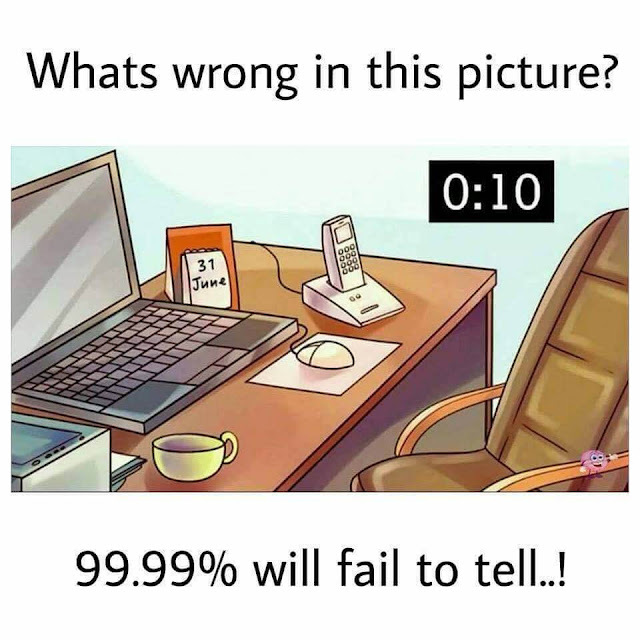 Here is the Puzzle picture which contains many different mistakes in it. How many mistakes can you find in this picture? they dont use those kinds of phones anymore!! The display is to large to be foldable with the keyboard. Keyboard buttons are irregular shaped. The phone requires two wires one for power one for the telephone line (it seem to have an answering machine included and hence it is not only a charging cradle). The mouse is on the right, so the user is right handed. However, the coffee cup is unnaturally on the left side. The coffee cup can certainly be on the left side, but the handle would be pointing tot he left, not the right. And I suppose the mouse pad could be where it is, but it normally would be off to the side. Where it is, the computer itself is too far away to use the keyboard comfortably. There is no 31st June ever.